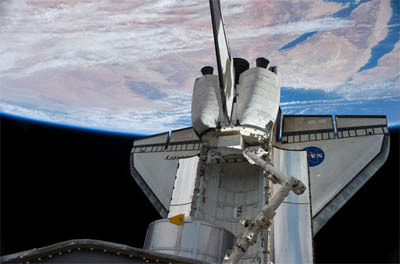 The shuttle Discovery's mission to the International Space Station has been extended one day to give the astronauts more time to conduct a final heat shield inspection while docked to the lab complex. Landing is now expected on April 19. The so-called late inspection normally is carried out immediately after undocking. Video and laser scan data is downlinked in realtime using the shuttle's Ku-band antenna system. But Discovery's Ku antenna failed to activate after launch and the astronauts were forced to use the space station's communications system to downlink inspection data collected the day after launch. Likewise, the astronauts will use the station again to downlink the late inspection data. "The Mission Management Team elected to add a day to the mission," said space station Flight Director Ed Van Cise. "The reason for that goes all the way to ... when the space shuttle Ku-band system was determined not to be operating. We have flight rules that say if the Ku-band is not operational, we need to an inspection of the orbiter while it is still docked to the space station. We call it late inspection. "When the Ku-band system is working, they will actually do that late inspection after they have undocked and that will clear the thermal protection system for entry. Since we need to use the ISS Ku-band system to downlink all those files and the video, obviously we need to do that before they have undocked. So we needed to have the time to perform those inspections. "We could either do that with our 13-day mission at the expense of some of the other mission objectives we already had planned, including all of this transfer, or we could add a day to the mission," V an Cise said. "And since we were carrying some contingency time we could add that extra day and make it a 14-day mission so that we could spend an extra day to go do that late inspection while we are docked." One other post-Columbia late inspection was carried out prior to a shuttle's undocking but in that case, the crew was leaving the shuttle's heat shield inspection boom behind on the space station for use by the next visiting shuttle crew. An updated flight plan for the remainder of Discovery's revised mission will be posted as soon as possible.